Band-Aid Brand Hydro Seal All Purpose Bandages help keep germs out and your body’s natural healing power in using hydrocolloid technology. Within 24 hours of application, a white bubble will form under the bandage which shows that the healing process has begun. These waterproof bandages provide advanced wound care and cushion to help protect blisters. Cushioning provides protection and relief from painful blisters and wounds. These bandages deliver multiday protection and stay on even through hand washing and showers. Ideal for use on chest, arms, legs and all other parts of the body. This package contains 10 individually wrapped Gel Bandages, each measuring (2 cm x 6 cm). Instructions for Use: Before Use, see instructions inside of box. Ensure you clean the wound and dry it completely. To ensure the bandage properly adheres, it is recommended that you do not apply creams, ointments or lotions to the wound. Carefully remove the white paper tabs and apply the gel bandage directly on the wound. There is no pad. The Dual-Action seal that is formed provides the optimal healing environment. Within 24 hours of application the product will begin to swell and a white bubble will appear over the wound. This signals that your body's natural healing process has begun. You can wear it until it begins to detach. If removal is required, carefully loosen one end by stretching it along the skin. Do not pull upwards. Caution: Those with diabetes or poor circulation should use under doctor's supervision. Do not use on fragile skin, burns, stitches, infected areas, deep puncture wounds, existing scabs or on children under 2 years old. 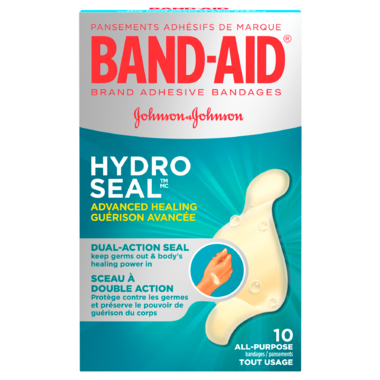 This Advanced Healing Bandaid is excellent for lesions, ulcers, deeper cuts or sutured cuts that need a bandage on for longer than a day. The Gel is semi-moistened by your body heat so they pull off fairly easily. They are quite waterproof. They can be left on for 4 days or so. I have used them for many years (specific skin condition) and have never ever had any skin at all torn off. And I have extremely sensitive skin. They definitely help minimize or avoid scarring on deeper wounds & cuts. This product is sticky on the whole side, and the silicone type product in it seems to melt into your skin or dissolve as it heals, so when you try to take it off, it pulls a couple of layers of skin off at the same time, including part of the would that was trying to heal.